US 'disgust' at Syria veto Jump to media player An Arab and Western-backed resolution condemning the violent crackdown in Syria has been vetoed at the UN Security Council by Russia and China. Syria forces 'in Homs massacre' Jump to media player Syrian government forces have bombarded the city of Homs with artillery shells and mortars, killing at least 55 people, opposition groups say. Activist: Homs situation 'so bad' Jump to media player Activists say Syrian forces have shelled the city of Homs and killed more than 200 people - a claim denied by the government. 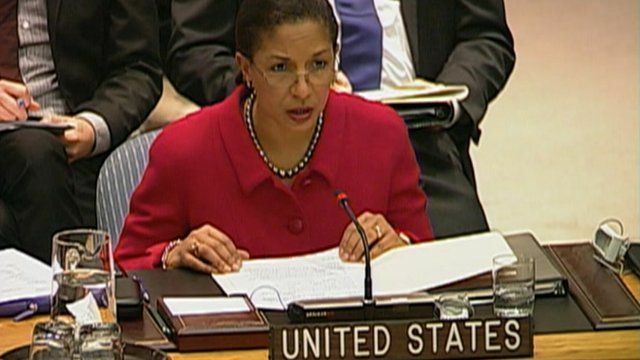 Speaking shortly after the vote in New York, the US ambassador to the UN, Susan Rice, said that Washington was "disgusted" and that the Security Council was being "held hostage by a couple of members". Moscow and Beijing rejected the draft resolution despite strong international condemnation of recent violence in Syria. 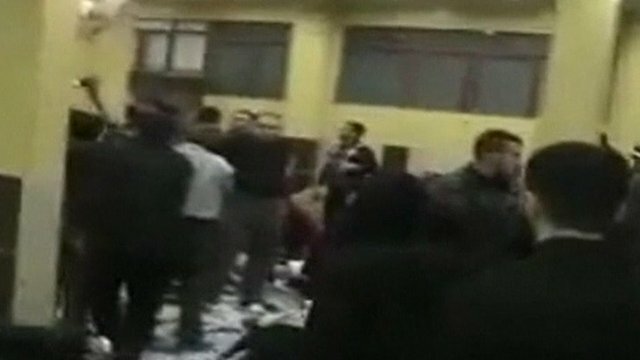 The vote came hours after activists accused Syrian security forces of killing at least 55 people at Homs. Speaking shortly after the vote in New York, the US ambassador to the UN, Susan Rice, said that Washington was "disgusted" by the move.